John Bowen’s unsettling drama, considered an influence and precursor to The Wicker Man. Norah Palmer (Anna Cropper) is a television script editor who temporarily moves to a remote English country village to rebuild her life. At first, she finds that the villagers are friendly, if a little eccentric. When she becomes pregnant to the handsome villager Rob, she begins to suspect the locals of conspiring against her, preventing her from leaving the village for her home in London. 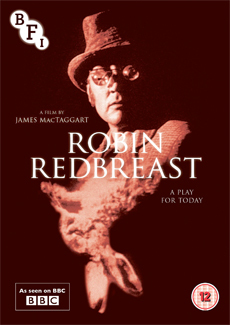 With its combination of unsettling folk rituals and insular regional communities, Robin Redbreast is considered to be an influence and precursor to The Wicker Man (1973), and has built up a cult following over the years since its original broadcast. Made during the golden age of British TV drama, and originally shown in the Play for Today strand, this provocative and unsettling drama was directed by the renowned producer / director James McTaggart from a script by John Bowen. Interview with John Bowen (2013, 12 mins): the celebrated writer discusses his career ad the origins of Robin Redbreast. Around the Village Green (1937, Evelyn Spice and Marion Grierson, 11 mins): short film offering insight into the changing economic and social history of village life. Illustrated booklet featuring essays and biographies by Vic Pratt, William Fowler, Oliver Wake and Alex Davidson, and full credits. Interview with John Bowen (2012, 12 min): John Bowen discusses his career and the origins of Robin Redbreast.